The Palm Beach County Sheriff’s are investigating a crash involving a stolen ATM. Just before 5:00 am, deputies responded to a crash located in the 4800 block of Okeechobee Blvd, WPB. Upon arrival, deputies were advised that a truck was dragging an ATM northbound on Haverhill Road. Deputies located a Ford Truck F250 on Haverhill Road just south of Century Blvd with an ATM Laying in the road approximately 10 feet in front of it. A second location, at Bank United, a box truck located crashed into the Bank United sign. It appears suspects used the box truck to strike the “free standing ATM” the dragged the ATM behind the F250 onto Northbound Haverhill Road. At some point it appears the ATM got in front of the F250 and the F250 front bumper struck the ATM causing airbags to deploy. The suspects fled upon impact and are still at large. Both the F250 and box truck were reported stolen. • 12:11 am, a gray Nissan pulled into the parking lot of an industrial area (Gardens Road, Riviera Beach) and stole a white Ford F-250. 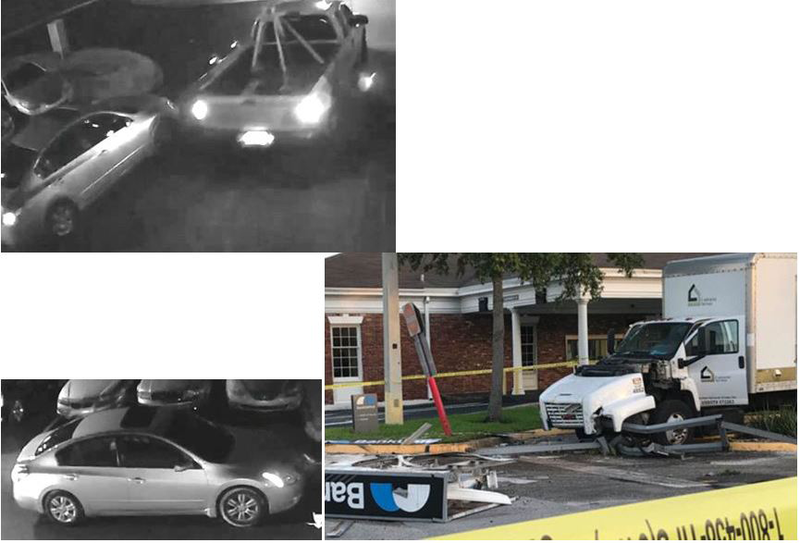 • The suspects drove the stolen F- 250 to (Prospect Ave, Riviera Beach) where they stole a white GMC box truck. • The suspects drove both stolen trucks to the Bank United (4700 block of Okeechobee Blvd, WPB) where they used the box truck to smash the ATM. The suspects abandoned the box truck and fled the bank with the ATM tied to the bumper of the F-250. • At 4:45 am, while driving down Haverhill Road the ATM broke loose, causing a crash. All suspects, three black, armed, masked males abandoned the vehicle and fled. • Deputies located the crashed F-250 and recovered the ATM intact. ← Boynton Beach Police are investigating a hit and run on Seacrest Blvd.